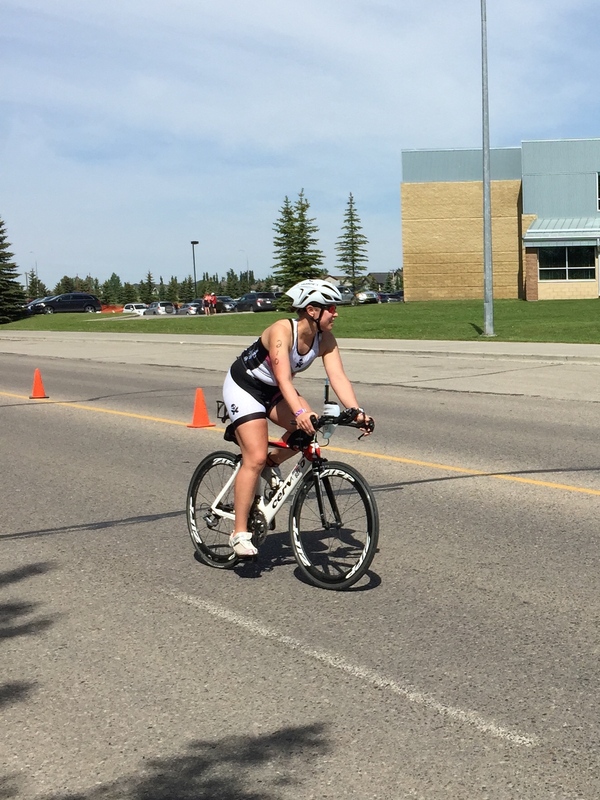 Sunday was my first triathlon of the 2015 season…the Strathmore Women’s Triathlon! 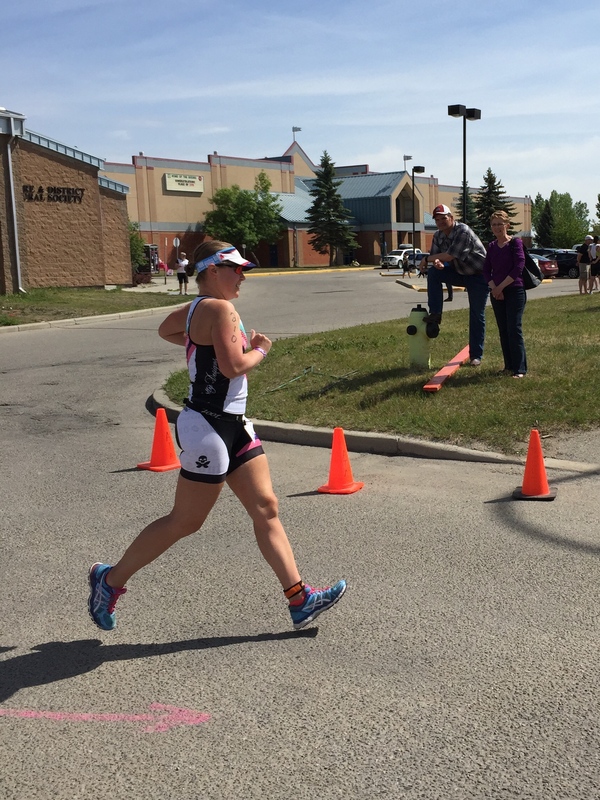 I really wanted an opportunity to race a smaller/shorter tri ahead of the Calgary 70.3 this year. 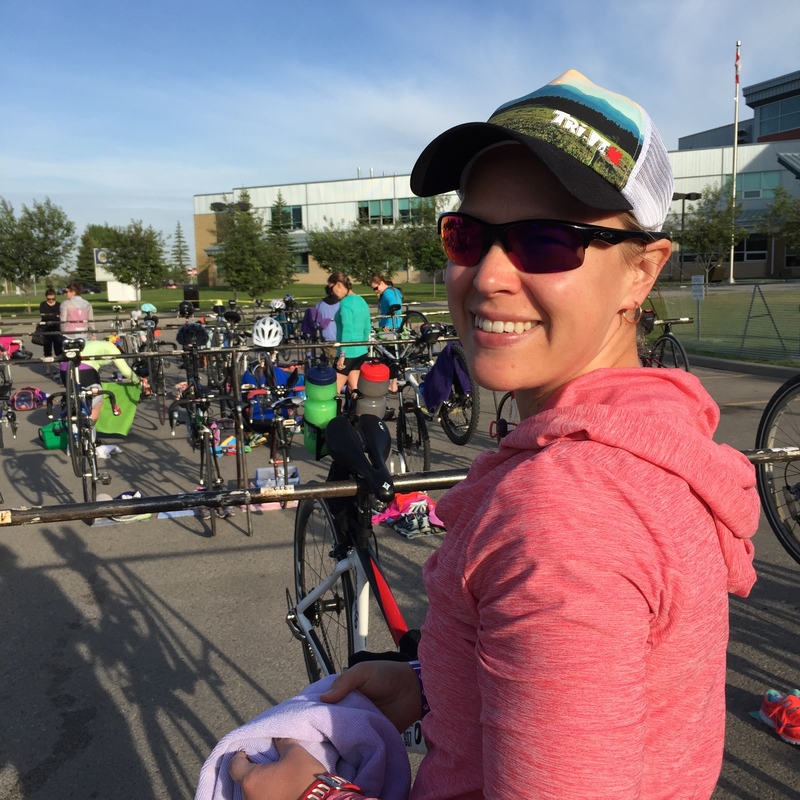 I think it is a nice way to remind myself how to set up transition and to get familiar with that feeling of racing off the bike. 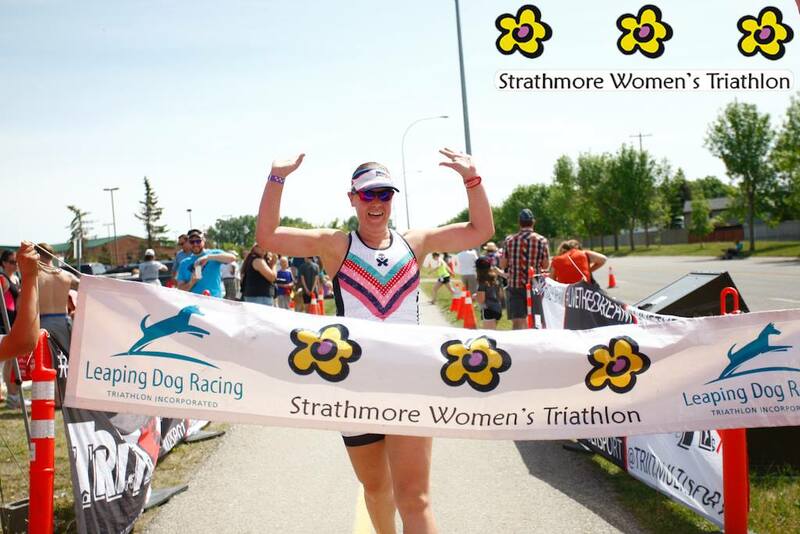 I also love the Strathmore race! 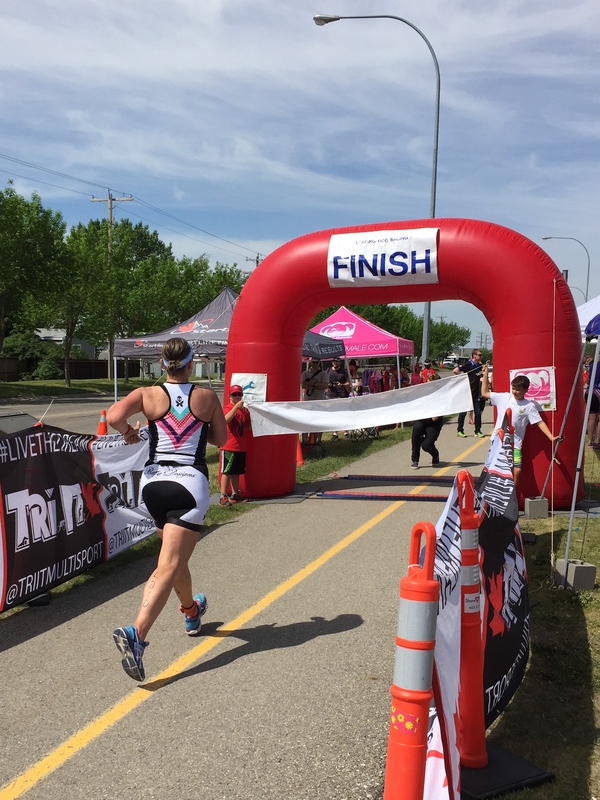 It was my first ever triathlon and it is always such a fun and supportive event. Neil and I got to Strathmore around 7:30 am…well in advance of the 8:05 athlete meeting. I picked a spot for my bike in transition and got everything I needed set up. I tried to keep my transition space simple and clean. I have a bright pink TMAT Pro that I laid my gear out on (but a towel would work just fine). 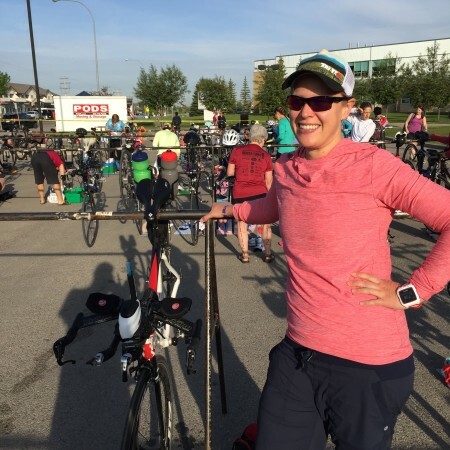 I had my bike helmet with my sunglasses and a towel in it (so I could wipe my face dry before putting my glasses on), my bike shoes with my socks inside my shoes, my race belt and number, and my running shoes and a visor. 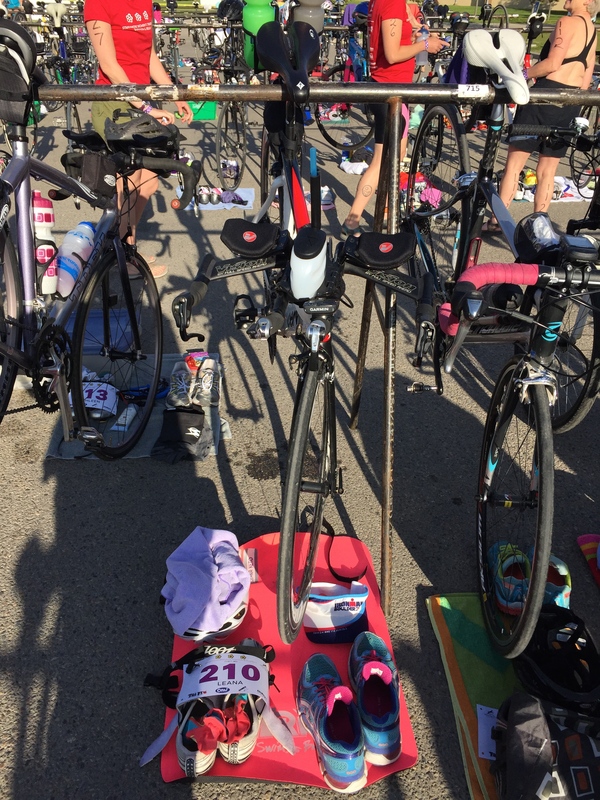 Once I was all set up I got body marked, listened to the athlete briefing, and then hung out in transition to cheer on the first few athletes to head out on the bike. 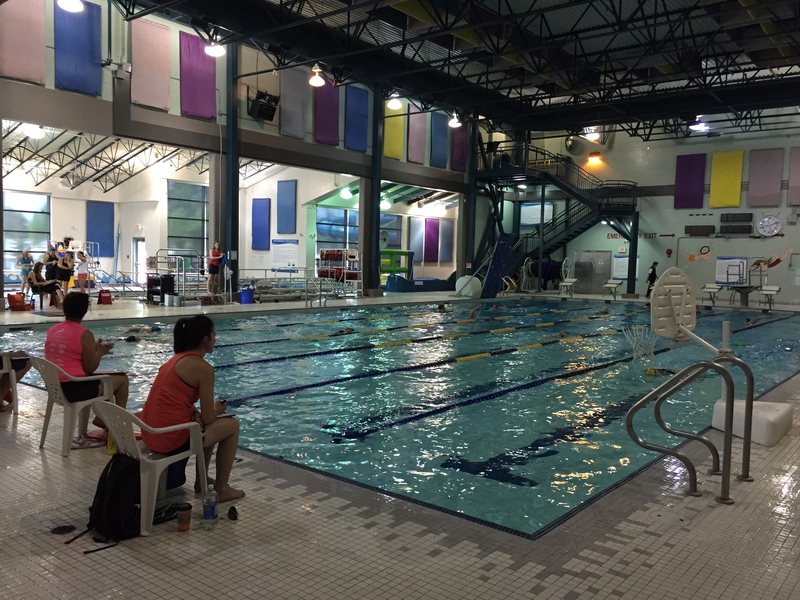 The swim was a 500 m pool swim, with athletes feeding into the pool continuously. Athletes were moving through the pool at a good clip and before I knew it, it was time to get lined up for my start! I took a gel, drank another sip of water and got ready to go. I got in the water and I felt great! 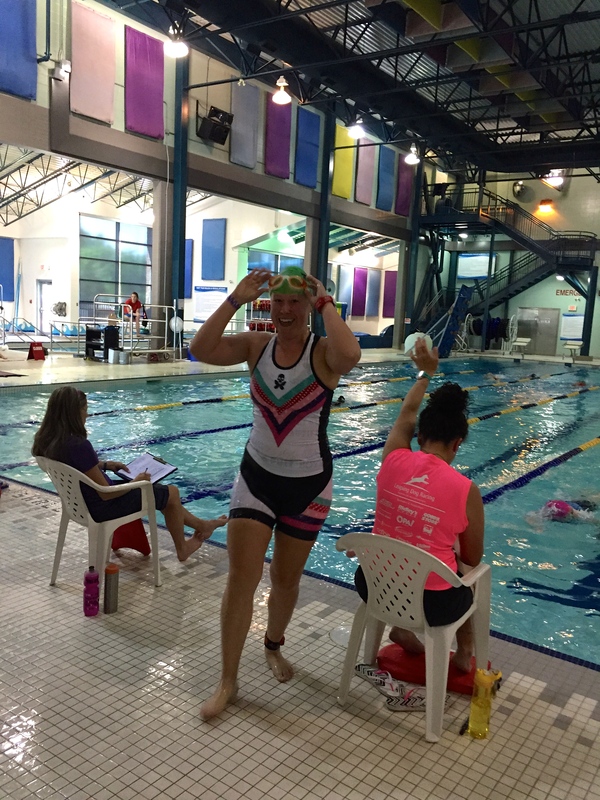 My goal was to swim at a consistent effort, focusing on power and gliding efficiently through the water. Unfortunately I didn’t set my Garmin up properly so it thought I was swimming in open water instead of lap swimming. No worries, this just meant I’d have to count my laps really well. Despite the fact that I was racing I felt calm. I glanced at my watch when I got out of the pool and saw 10:22 which was a few seconds faster than I was expecting. With the extra time walking into and out of the pool my official swim time was 11:04. It was 12:11 in 2013 and 13:51 in 2008. Hurrah for improvement! As soon as I found my bike I wiped my face dry, put on my sunglasses and helmet, then wiped my feet and tried to put my socks and bike shoes on in a hurry! Plus my race number belt! As soon as I got out on the road it was time to go to work! 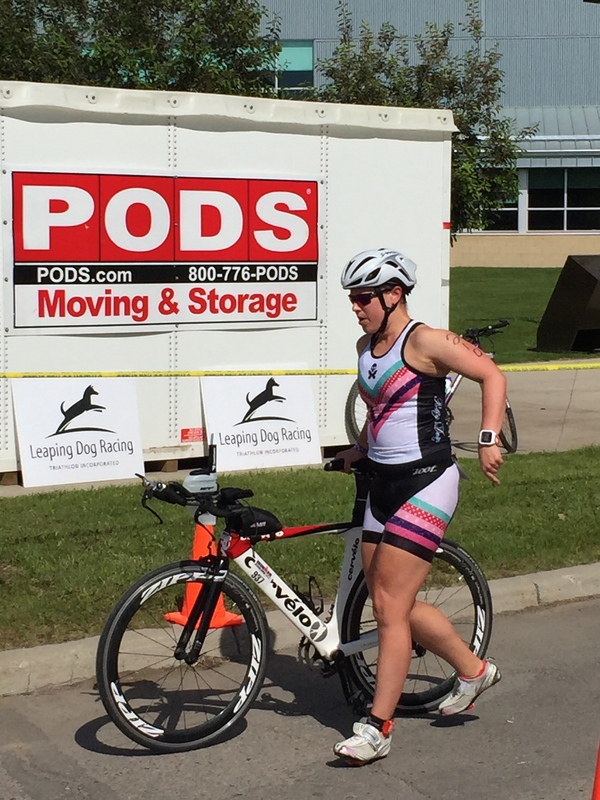 I figured that since this was a sprint tri this was my opportunity to push harder than I would in a race. The way out has a slight downhill so I got in aero and focused on pedalling strong. Every time I would pass a girl I’d give them a shout of encouragement and I tried to wave at the girls who were coming back on the opposite side of the highway. It was a hot day out there, with the high temperature forecasted at 30C. My goal for the bike was to drink my entire bottle of EFS (mixed at double strength) to make sure I was well hydrated and topped up on electrolytes. On the way back I passed a girl, gave her a shout out and as she started to yell back she said…”Wait a minute? 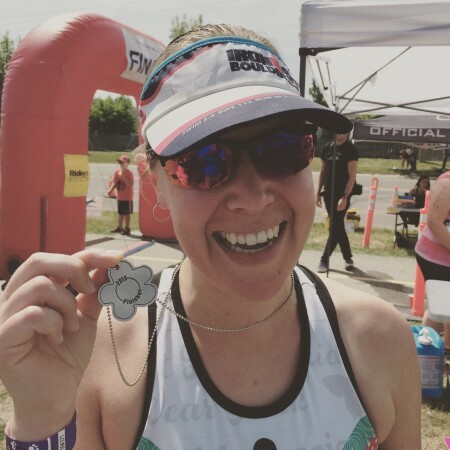 Are you Runner Leana on Instagram?” Thanks for the shout out Kari and I hope you had a great race! 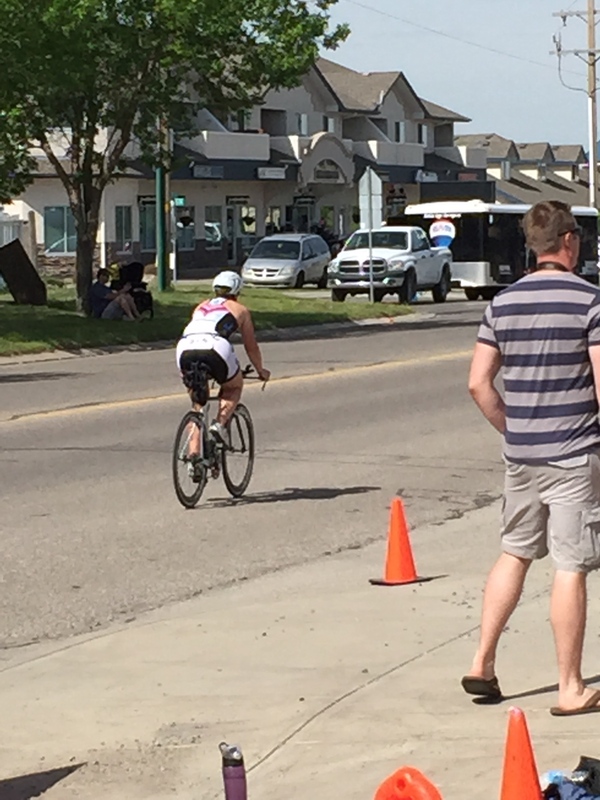 I hopped off the bike in 36:57…a nice improvement over both 2008 and 2013 when I finished in around 39 minutes. 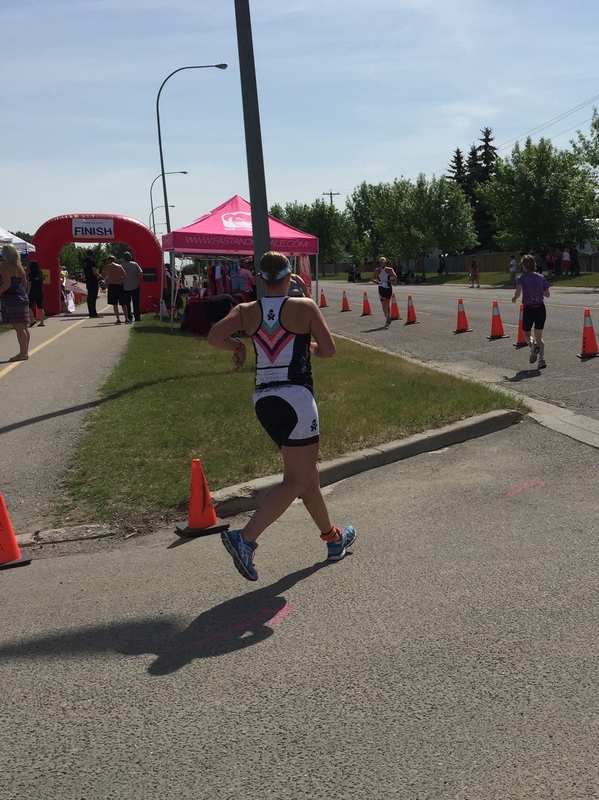 I racked my bike, swapped out my shoes, took off my helmet and started running! Thank you Lock Laces for making it so easy to get my running shoes on in transition. As is somewhat usual, my legs felt like garbage as I started on the run. I felt like I was plodding along and moving really slowly. Then I looked down at my watch and noticed I was maybe running a little too fast! The run was an out and back along patchways and through the neighborhoods of Strathmore. I tried to say “good job” to everyone I saw running towards me. 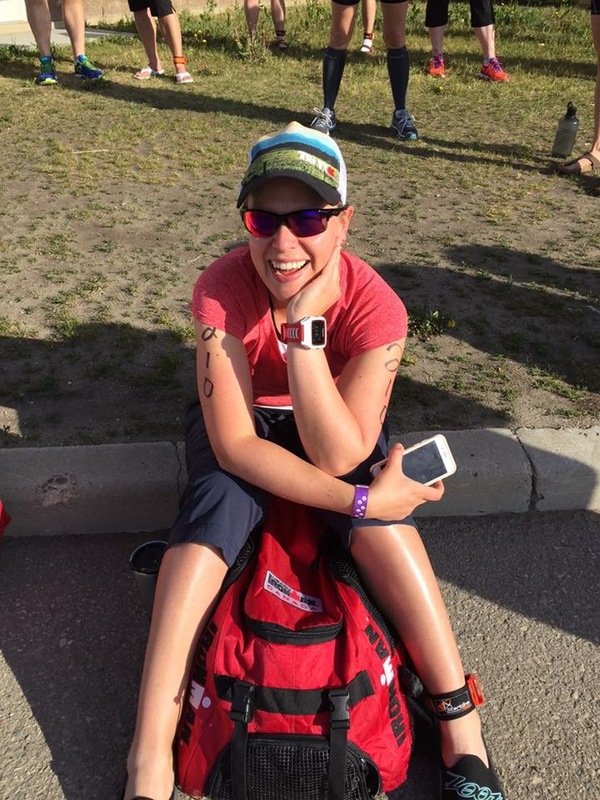 My race belt was bothering me slightly as I wanted it to sit lower on my hips and it kept riding up on me. Oh well. I was excited to get to the turn around because I knew my friend Tara and her two daughters were volunteering there. It was so nice to see them, to get words of encouragement and high fives! On the way back the run was feeling hard but I didn’t want to give up. I kept repeating over and over in my head “I am strong, I am strong, I am strong and I am fit” in time to my foot steps. Soon the finish line was in sight! I crossed the line in a total time of 1:20:05, a very nice 5:29 personal best at this race! I was so happy with my effort! I really enjoyed the day and raced hard but still had fun. 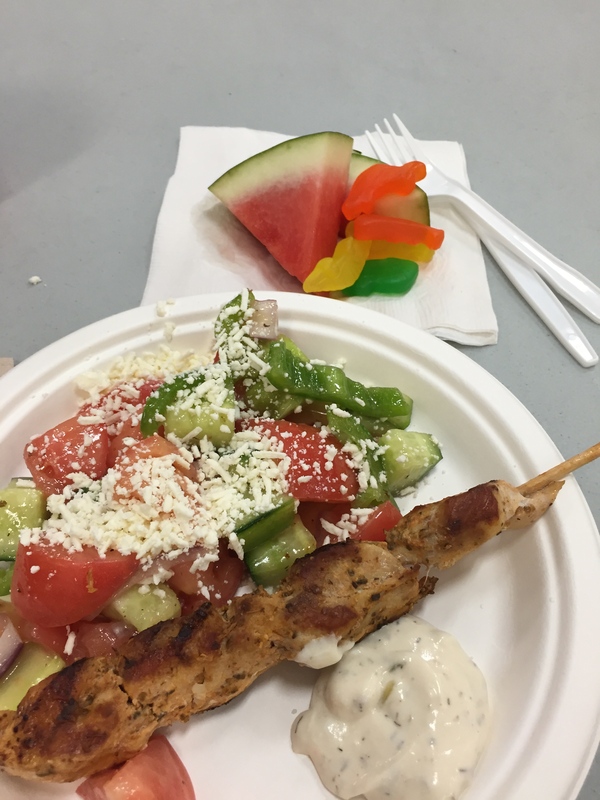 OPA was serving up chicken souvlaki and Greek salad for the racers (plus I was able to prepurchase a meal for Neil). We hung around for the awards and draw prizes and then made our way back to Calgary. All in all it was a great event and I had a wonderful day. 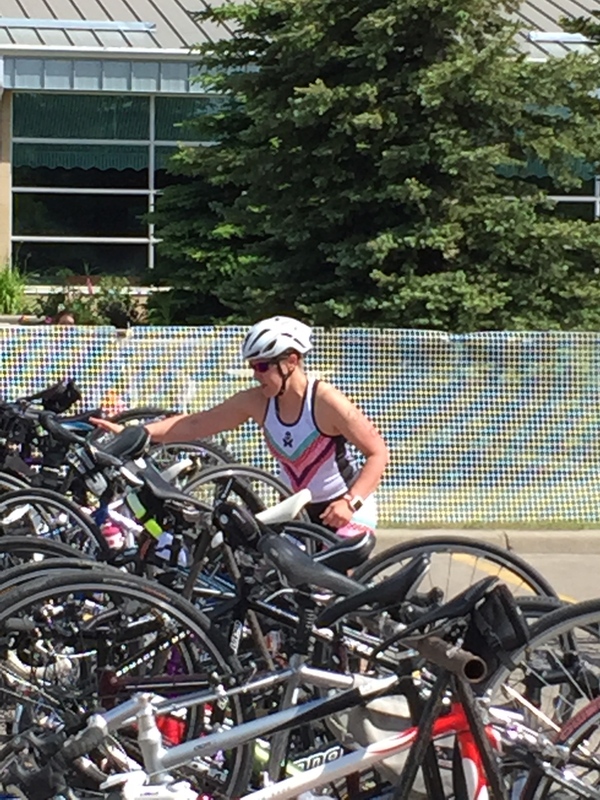 Racing in my Betty Designs kit was very comfortable as the shorts stayed put and my top did not ride up at all. I just need to make some adjustments to my race belt! 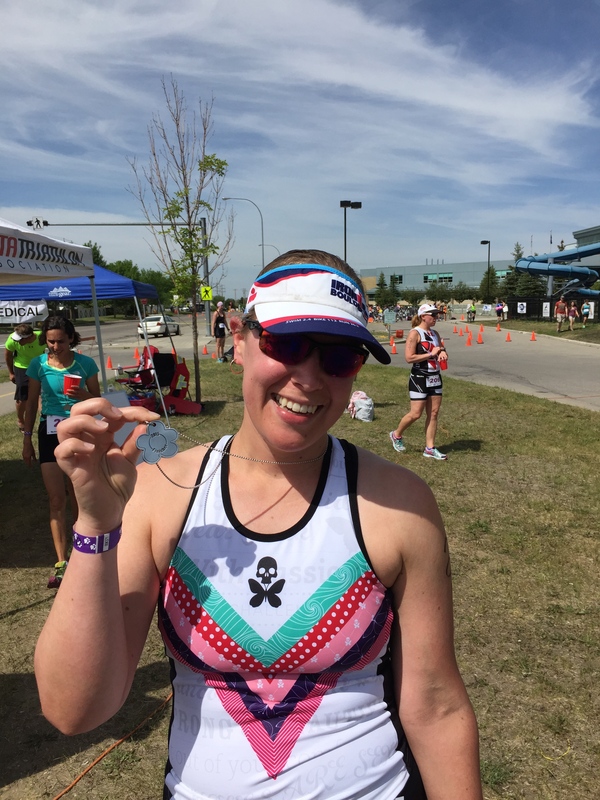 Now it is time to concentrate on training for the Calgary 70.3 at the end of July! Awesome Leana! 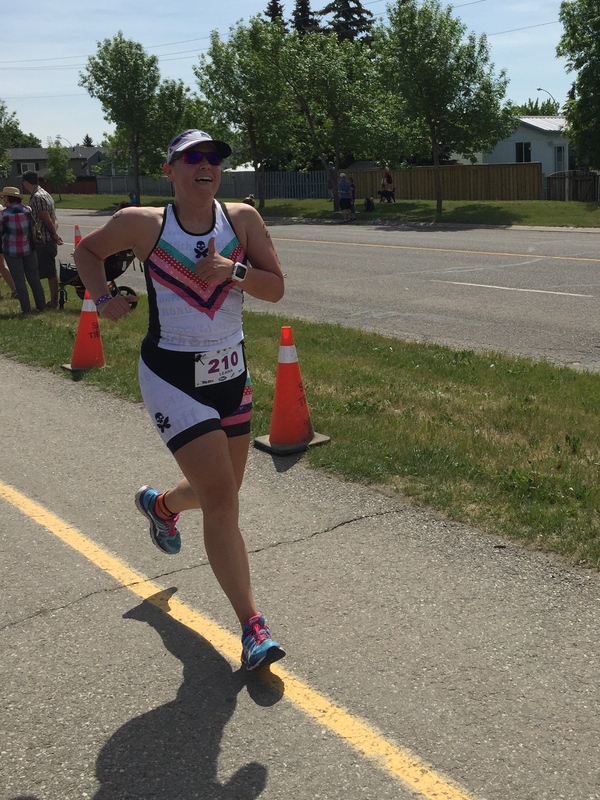 It’s great running the same races so you can see your improvement over the years and it seems you are definitely getting stronger. Opa afterwards is an awesome post race meal. Congratulations on a fantastic race! Congrats on the PR! You can’t go wrong with Greek food after working hard. HOLY HELL GIRL!! Nice work!!! I’m so proud of you, what a race!! 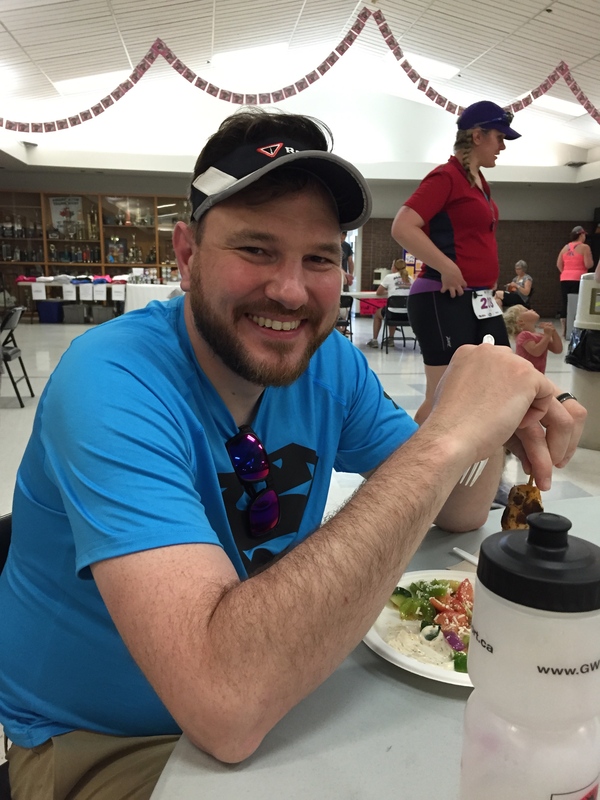 Kris recently posted…The other half of my marathon training plan. Awesome Leana. You did SO well, and your outfit was so cute! Wow what a great job. Wish I could swim, I’d to try a tri at some point. Wow! 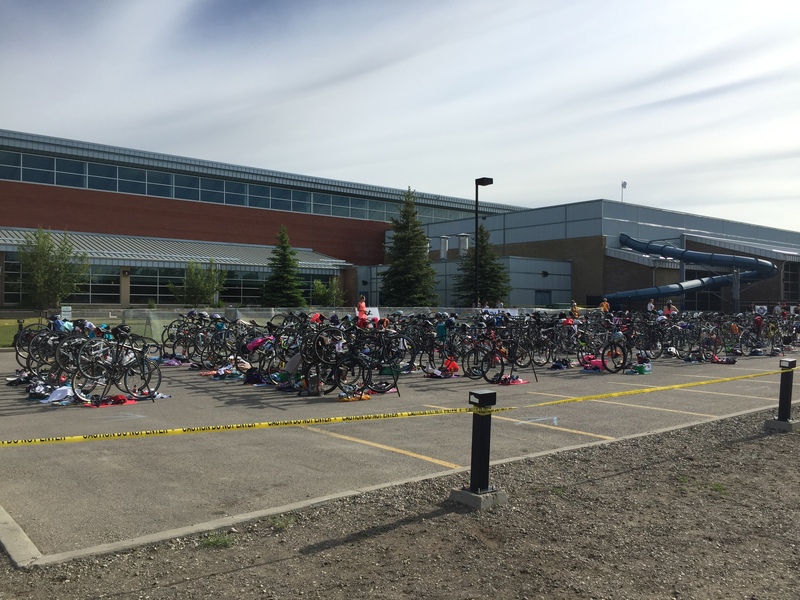 Great job on the “tune up” triathlon. Great pics as always too!